June 8th, 2008: Debra Tate is filming an interview with Dateline NBC this week. At this point we're not sure what date the program will air. Dateline NBC airs Friday and Sunday nights, 9-11 p.m. ET. United States to France just before being sentenced. 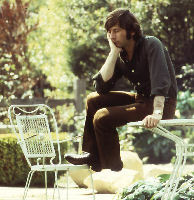 at the center of the 1977 case. and with his celebrity I think that's going to be hard." idea of who Roman Polanski is. people she knew during the time she lived in El Paso, TX. sweet girl. We ran around together and spent the night at each others home, she said. After her family moved to Italy, our friendship sort of dwindled and I only got a couple of letters from her then." planned for this Summer in Los Angeles. wearing Sharon's clothes will be on display at the exhibit. are rare examples of their early work from the 1960s. The clothes have been put safely back in storage. unique style. A style that transcends time and is as relevant today as it was in the 1960s. May 6th, 2008: Sharon Tate's private clothing collection. 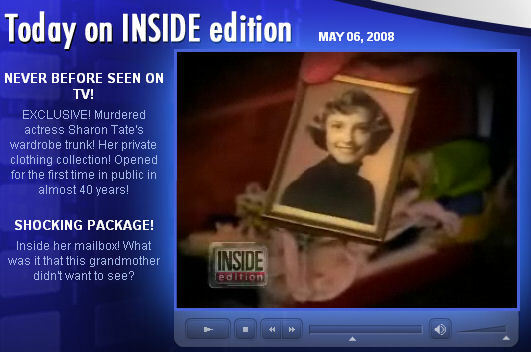 Exclusive on Inside Edition. glimpse at the private life of Sharon Tate. moments. That is why I don't open it often. I can still smell her scent. wardrobe. Below are some of the photos from the shoot. "Linda (working with M.A.C) and Sophie (for ghd) both took their beauty cues from the late 1960s. April 28th, 2008: A new tel-biography of Sharon Tate is set to premiere on Investigation Discovery in May. long program dedicated to the "final days in the Hollywood icon's life." May 08, 12:00 am, May 08, 3:00 am, May 10, 3:00 pm, May 18, 1:00 am and May 18, 4:00 am. Check your local listings to confirm date, time and channel. character of the Movie Alfe was based, died Saturday night at a hospice in London. Rosemary's Baby, at a screening of the film. at 7 p.m. For more information call 214-821-3456. For tickets call Ticketmaster at 214-631-2787.
don't see," he says. "They're participating in the visualization of the movie. That's the beautiful hook. at USC. He served three terms as president of the American Society of Cinematographers. and a catchy title song by the Byrds." Leonard Maltin. When: April 18th, at 7:30pm Pacific Time.